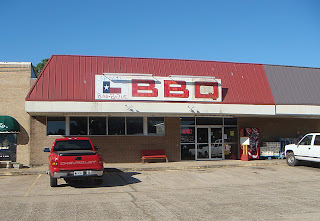 I had passed by this place a couple of times on the way to Lake Fork and finally got a chance to sample it one afternoon when my fishing trip ended a bit earlier than usual. It looks pretty funky from the outside but the inside was clean and cavernous. 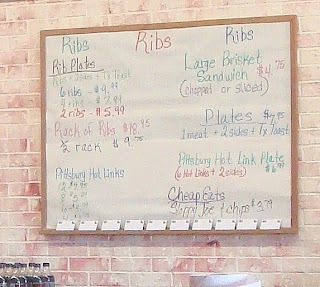 I was the sole customer and the friendly lady behind the counter quickly filled my order of brisket, sausage, ribs, baked beans, and tater salad. The meat was pulled out of a warmer wrapped in foil, but being 4 pm that was really no surprise. The sausage was average Ekrich and immediately forgettable. The brisket and ribs were another matter. The brisket had a nice smoke ring and gave way easily to a poke from a plastic fork. It had excellent smoke flavor but was a tad dry, probably due to sitting in a warmer til 4 pm. The ribs were juicy and falling-off-the-bone tender and also had an awesome smoke flavor. No dryness there at all. The baked beans were tasty with big chunks of bacon floating in them. The tater salad had a creamy mayo base and was also better than average. The sauce was a little weird. It tasted like chili powder in honey and was not to my taste at all. Two out of three on the meats at a 4 pm stop is not bad at all. I need to try this place again during lunch or dinner and try some fresher cuts. 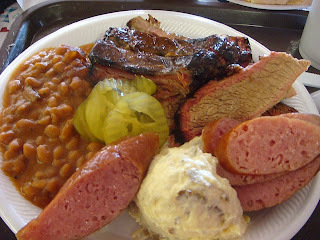 They also sell East Texas style hot links. 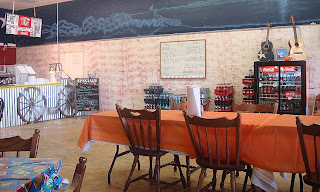 I'm hoping they do a big lunch or dinner business because it was sure lonely when I was there! With food this good they should be doing a much better business. UPDATE 3/31/10 This place has moved south of Quitman on Texas 37. I will resample next week.